Bee's wax candles are clean, natural, dripless and slow burning. Pure bee's wax candles are very slow burning so you can expect an hour of beautiful soft yellow light per inch. These candles are 6 inches long so expect each to burn (when properly trimmed and erect) for 6 hours. Bee's wax was used to wax and smooth the outside of linen thread so the thread does not fray as it is pulled through the fabric. A candle may be used for this purpose just as a cake is. Just hold the thread against the candle with your finger and pull the thread. Coat both sides and sew. 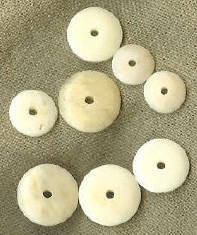 Wax may also be used to initially hold thread on thread winders and to keep tops on containers. Our bee's wax is pure, filtered, with a delicate natural honey sent.